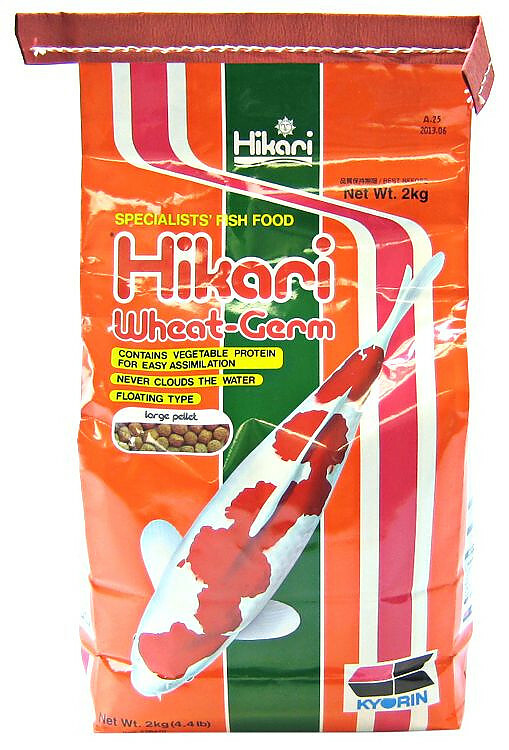 Hikari Wheat Germ Large Floating Pellets fish food is a highly nutritious diet formula that is easily assimilated and provides a highly digestible daily diet for Koi and other pond fish, including Goldfish. It never clouds the water and provides a vitamin-rich formula that aids fertility and vitality, especially in colder winter weather. Developed through many years of breeding experience, this highly nutritious diet is extremely effective in cooler climates which experience a winter season. Pet Mountain is proud to offer discount bulk pet products. The floating wheat germ pellets allow for easy monitoring of amount eaten. 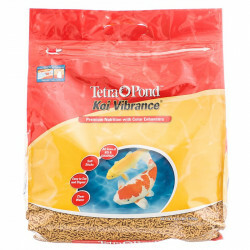 The digestibility of this product helps eliminate over-feeding and reduces water quality problems. 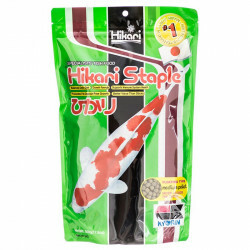 Contains stabilized Vitamin C which promotes resistance to stress and infectious disease. Promotes a long, healthy life through excellent daily nutrition. It takes a full ton of wheat germ to get 100g of wheat germ oil, an excellent source of vitamin E, linoleic acid and other essential nutrients for your fish. Wheat germ oil has more vitamin E than other cereal oils and more of the vitamin E alpha component found to be essential for long-term health and vigor. Linoleic acid is a vital component in cell walls and provides necessary hormones to the body, among other known benefits. Feeding Suggestions: When water temperature is consistently below 40 degrees, stop feeding. Once water temperature is consistently above 40 degrees, but below 60 degrees, feed once daily. If water temperature is consistently above 60 degrees but below 70 degrees, two times daily during the warmest part of the day. When water temperature is consistently above 70 degrees, feed two to four times daily. Warmer temperatures bring more activity which requires more food. 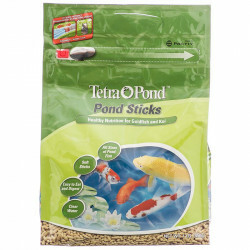 Please do not exceed the amount your fish will eat within three to five minutes of feeding. Remove all remaining food after the feeding period to avoid over-feeding and the water quality problems which can result from this action. 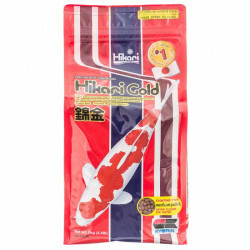 Note: During any appetite loss, after sickness or during medicating, your koi's eating habits may be significantly reduced, careful monitoring of the amount of food you feed is required to avoid problems. Ingredients: Wheat Germ Meal, Fish Meal, Wheat Flour, Rice Germ Meal, Gluten Meal, Wheat Bran, Starch, Dried Bakery Product, Protease Enzyme, Brewers Dried Yeast, Garlic, Monosodium Glutamate, Vitamin A Oil, Vitamin D3 Supplement, Vitamin E Supplement, Menadione Sodium Bisulfite Complex (source of Vitamin K), Choline Chloride, L-Ascorbyl-2-Polyphosphate (Stabilized Vitamin C), Calcium Pantotenate, Riboflavin, Thiamine Mononitrate, Pyridoxine Hydrochloride, Niacin, Folic Acid, Biotin, Ferrous Sulfate, Magnesium Sulfate, Zinc Sulfate, Manganese Sulfate, Cobalt Sulfate, Copper Sulfate, Calcium Iodate, Aluminum Hydroxide, Selenium Yeast.